NATCHITOCHES – The City of Natchitoches will sponsor Witch Way to Main Street in downtown Natchitoches on Monday, Nov. 1, 2010 from 5 p.m. to 7 p.m.
Children 12 years old and under will be allowed to trick-or-treat at participating downtown shops. Area organizations and businesses will also have booths set up along Front Street distributing candy and offering carnival type games and activities. 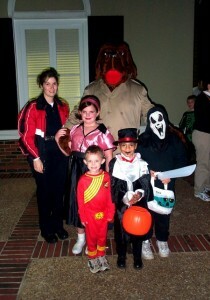 Children must be in costume and accompanied by an adult to participate. Candy will be distributed on a first-come, first-served basis. Natchitoches police officers will be on duty to ensure children’s safety. Front Street will be shut down from the Church to Lafayette Street, beginning at 3 p.m. The downtown riverbank will remain open for through traffic and parking. The City of Natchitoches will observe neighborhood trick-or-treating for Halloween on Sunday, Oct. 31 from 5 p.m. to 8 p.m.
For more information about Witch Way to Main Street, please call the Main Street Office at (318) 352-2746.